What's Happened? What's Happening? 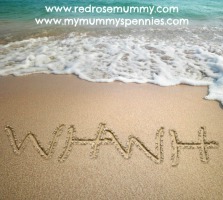 is a linky hosted by Jen from My Mummy's Pennies and Pippa from Red Rose Mummy. We love family days out and attending events. Thanks to the blogging world we get fantastic opportunities to visit amazing places and attend some exclusive events, we also go on our own adventures and sometimes a day exploring the hidden treasures of a local museum or outdoor space can be just as exciting as the opening of a new attraction at our favorite theme park or show at the theatre! We want to celebrate days out and events of all different kinds with What's Happened? What's Happening? It's the place to come and link up your posts about family days out, festivals, exhibitions, blogging events, theatre shows and more! If they've already happened, share your blog posts all about them on the What's Happened? linky so we can read all about them, if you're writing about something that's coming up, such as a show, festival or exhibition then we want to know all about it on the What's Happening? linky! What's Happened? What's Happening? will be live every other Thursday from 7am and will be open to add your posts until the following Monday at midnight. Please feel free to join in both parts of the linky and add up to two relevant posts in each. If you do link up please make sure you visit your hosts Red Rose Mummy and My Mummy's Pennies to leave a comment as well as a few of the other posts if you can, its a great way to find out about new places to visit! Each time we'll be featuring posts from the previous link ups, sometimes with a theme, sometimes simply because we wish we'd been there! We'll also be highlighting the best of what's happening so you don't miss out on any must see events! We'll be reading every post, sharing our favourites on Twitter and Facebook and pinning on to the What's Happened? What's Happening? Pinterest Board. Follow Red Rose Mummy's board What's Happened? What's Happening? on Pinterest. If you link up please tweet us your post tagging @mymummyspennies and @redrosemummy using the #WHWH hashtag and we'll happily retweet it for you! See the latest linky here. We would of course love it if you grabbed our badge and popped it on your post too! I love to go and enjoy the heart touching scenes of natural beauty like many folks. Your tourism related article best dissertation writing services reviews is so good for me as I read about many beautiful places through this. Thanks to the blogging world we get fantastic opportunities to visit amazing places and attend some exclusive events, we also go on our own adventures and sometimes.